Wow... what a strange noise to wake up too.... RAIN! It was sssoooo windy and rainy here this morning... it woke me up. I haven't heard that noise for a long time. We sure need the rain. My yard is pretty darn SICK looking. Now that it appears it's going to be SPRING in March - the rain will do my yard wonders! We don't have a sprinkler system... I'm NOT into moving the hose around the yard! NOPE... not going to happen! Well... remember when I told you I wanted to work on my picnic basket "wool" lid??? I DID!!! here is where I am so far!! It's still in the stitching phase... but it's coming along. Once I have it all stitched...I'm going to do some additional embroidery, I'll cut it to the shape of the lid - add some piping around the edge and glue it down!! I so enjoyed working on it while watching movies yesterday. I felt so productive!! Don't you love it when a plan comes together? I've also decided to make some chocolate chip cookies to take with me. Now... with my diet... this is NOT a good thing... HOWEVER.. I'm stuck right now on NOT loosing weight... so I've given myself permission to have a couple of cookies and then tomorrow... I'm stapling my lips shut... only leaving them open ..."just a tiny bit"... to jam a straw through them... for a day of liquids only! Protein drinks...that seems to get me jump started on loosing those pounds again! MAN... I HATE TO DIET!! 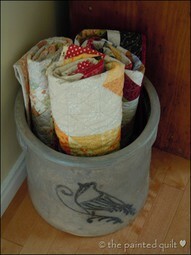 Isn't this a cute way to store your smaller quilts? I love old crocks (have several myself) and then to add your adorable smaller quilts - all rolled up - is the icing on the cake!! I'm going with that anyway! 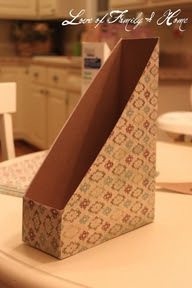 I've always loved these type of book/magazine/pattern holders... I'm not sure why... JUST DO! This lady has taken a used cereal box and cut it down to look just like the ones you buy! She then took some scrap booking paper (that she already had on hand) and covered the outside. She also stated you can do the same thing with fabric. Aren't they cute? LOVE THEM... they would look so cute in your kitchen holding your recipe books! 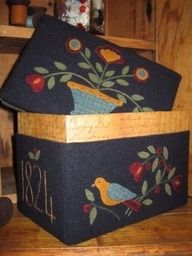 This beautiful wood box is covered with wool applique.... I LOVE IT!! You can cover anything with wool... it doesn't have to be an expensive wooden box. Heck... the cereal box (like above) is a great item to use also. Remember the stacking boxes you can buy? We sold tons of them at the Olde Green Cupboard... well... sometimes the lids get a little faded... !! 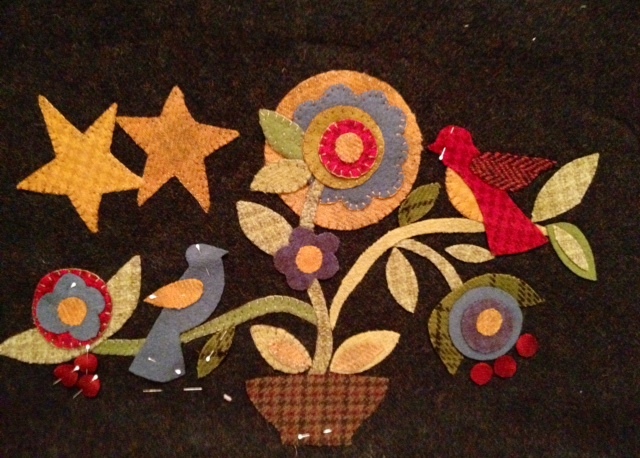 Cover it with a beautiful wool applique design. If you don't want to stitch it... use glue! It's not like you are going to handle it a lot ... so glue may work just perfect. 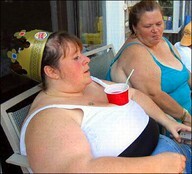 Okay... this lady is REALLY multi-functioning... she's obviously had lunch (thus... the Burger King crown), she's sitting outside... letting her children PLAY... whe's visiting with her friends, she's getting some Vitamin D (sunshine), SHE'S COOLING OFF, AND ... she has her own built-in CUP HOLDER!!! hhahahahahaaa... I thought this was a hoot. I wonder if this chick knows her photo is all over cyber-space? Gotta love her!!! This ... my friends... is taking knitting to a brand new era!!! I can't figure out what the yarn is made from.... rope? rags? Whatever it is... it takes a WHOLE BUNCH OF IT!! Wow... what a great way to get a workout! Just knit for awhile! This is our "feel good" picture for the day... !! What great friends... I can just hear that little doggie talking his friend "Flicka" into giving him a ride across the water. The poor dog kind of looks like a drown rat doesn't he? He also looks VERY COLD and SCARED! Don't you wish you could talk to animals... or understand what they are thinking... ?? I've always wanted to..every since I was a little girl. That's another one of those wonderful questions that will be answered when I'm in Heaven! "Why can't we talk to ALL animals?" Ok... I smell BACON!!! That means breakfast is almost ready... YIPPEE!!! I'm starving this morning... then I have to put a corned beef in the crock pot and make my CHOCOLATE CHIP COOKIES!!! OMG... I can't wait to sink my teeth into one of those bad boys. Catch you on the flip side...!! Hugs all the way around! !